Fine Lines - Four artists trace the edge of sustainability Bing Dawe, Denise Copeland, Graham Bennet, Robyn Webster Diversion Gallery, Picton. Sculpture in the Gardens group show, Botanical Gardens. Auckland. Undercurrent Denise Copland & Bing Dawe Chambers 241 Christchurch. Extant- Bing Dawe & Ben Reid Chambers 241, Christchurch. Tuna selected by the Friends of Gardens to become part of the gardens permanent collection. Bing Dawe - Sculpture and Painting Whitespace, Auckland. Selection 6 - The Artist's Selection, group show, Jane Sanders Art Agent, Auckland. Sculpture in the Gardens, group show, Botanical Gardens. Auckland. Sculpture in Central Otago Rippon Vineyard, Wanaka. Judge for the Charlaton Ink Drawing Prize, New York. Selection 010 -011, Group show, Jane Sanders Art Agent, Auckland. 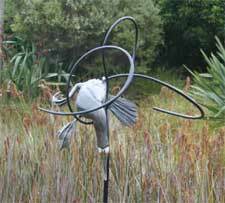 Dowsing & Divinging, sculptures and works on paper, Jane Sanders Art Agent, Auckland. Dowsing & Divinging, sculptures and works on paper, The Art House, Christchurch. Stoneleigh Sculpture in the Gardens- group show, Botanical Gardens. Auckland. Head On, Bing Dawe & Peter Cleverley, Gallery 33, Wanaka. Vagrants, Stragglers and the Unloved, Suter Gallery, Nelson. Vagrants Stragglers and the Unloved, The Art House, Christchurch. Sculpture in Central Otago, Rippon. Divine Rights series and A Landscape with Too Many Holes – new sculpture and works on paper, The Diversion Gallery, Marlborough. The Fishing Show. COCA Gallery, Christchurch. The Lighthouse Keepers Cat. Work's on paper. Vinnies Art Box, Auckland. Roundel. New Works. The Art House, Christchurch. Artist to Save Our Water.Ng Gallery, Christchurch. Dilana Rugs, selected artists, Paris, France. The Christmas Show.The Art House, Christchurch. The Slate Show. Invited Artists, COCA Gallery, Christchurch. Stonleigh Sculpture in the Gardens,Auckland Botanic Gardens, Auckland. Make Way - New sculpture and drawing. The Art House Christchurch. Art House Opening Show.The Art House Christchurch. Sculpture In Central Cottage, Central Otago. 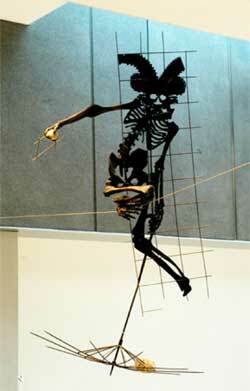 Make Way-sculpture and drawing. Gallery 33, Wanaka. New Sculpture and Drawing. McPherson Gallery Auckland. 20 X 20,Group show McPherson Gallery Auckland. Bing Dawe.Sculpture.The Art House, Christchurch. Sculpture In The Garden. Olsen's Vineyard, Bannochburn. Central Otago. End To Begin Again. CPIT Staff Exhibition, COCA Gallery Christchurch. Signify - Group show, Ashburton Art Gallery. Diversions Divisions (small birds with hoop Wairau River)Diversion Gallery, Blenheim. SOFA Print Project, group show, SOFA Gallery, Christchurch. Artists against Aqua, Forrestor Gallery, Oamaru. Group Exhibition, Finial (composition with decoration and wading bird). Campbell Grant Gallery, Christchurch. Hosting the Cuckoo, McPherson Gallery, Auckland. Selected Artists, Pied, Ng Gallery, Christchurch. Sculptors at Olsen's, Diversion/Division (bird with cross Wairau River), Olsen's Vineyard, Cromwell. Provenance - Bing Dawe and Peter Cleverley,Ashburton Art Gallery. The Spirit of Sculpture From the Draining. Eels with Hoop, St Matthews in the City, Auckland. Provenance – Bing Dawe and Peter Cleverley,Eastern Southland Gallery, Gore. Trilogy,Diversions Divisions (small birds with hoop Wairau River), Diversion Gallery, Blenheim. Parklands Library Commission, Christchurch City Gallery Te Puna O Waiwhetu. Bing Dawe & Peter Cleverly at Punatapu, Queenstown. Big Fish, From below Tekapo Dam [large fish with hoop], COCA Gallery, Christchurch. Southern Gentlemen, group show, Dilana rugs, 40 George Street, Auckland. Provence - Bing Dawe and Peter Cleverley Forrester Gallery, Oamaru. 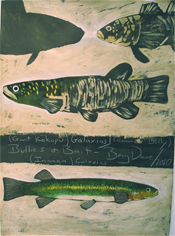 Eels, Dilana Rugs Gallery, Christchurch. Solo Exhibition of Drawings and Rugs. Kaik, Solo Exhibition, Port Gallery, Port Chalmers. Fund Raising Auction, COCA Gallery, Christchurch. Bing Dawe Charlotte Fisher, Campbell Grant Gallery, Christchurch. Pacific Rim, Contemporary NZ Medallic Sculpture Medallia Gallery, New York (group exhibition). Shadow Casters. NZ Medallion Group,McPherson Gallery, Auckland. Coming Home in the Dark,Christchurch Art Gallery Te Puna O Waiwhetu (group exhibition). A Comparison of Scale,Percy Thompson Gallery, Stratford (group exhibition). White boards, Blue Oyster Gallery, Dunedin. Trilogy, The Diversion Gallery, Waihopai. Still Life a group exhibition -(Dilana rugs), 40 George St, Auckland. Wry, Campbell Grant Gallery, Christchurch. Recent Works, Forrestor Gallery, Oamaru. Out of the Black Water, The Diversion Gallery, Waihopai. Acts of Enquiry, Robert McDougall Art Gallery, Christchurch. Sculptures ’97, The Drawings Gallery, Auckland. Aesthetic Departures – The Art of Death, group show, COCA Christchurch. Untitled Metaphors, Canterbury Gallery, Christchurch. Expanding Sculptures, Jonathan Jenson Gallery, Christchurch. An Exhibition of Works, Dilana Gallery, Christchurch. Thinking about Contemporary Art, Centre for Contemporary Art, Christchurch. Part of the Furniture, group show, McDougall Art Annex, Christchurch. Artist’s Rugs, Artis Gallery, Auckland. New Work, Canterbury Gallery, Christchurch. Drawings:Artist Survey, The Drawings Gallery, Auckland. Sister City Celebration, Adelaide, 1993. New Sculptures/92, Canterbury Gallery, Christchurch. Expanding Spaces, Jonathan Jensen Gallery, Christchurch. Constructed Intimacies, (Moet & Chandon touring exhibition), New Zealand. Dilana Gallery Carpets, touring exhibition, Washington, Chicago, New York. Barry Cleavin/Trevor Moffitt/Bing Dawe, Carnegie Centre, Dunedin. Sculpture 2: Aspects of Recent New Zealand Art, Auckland City Art Gallery. Five Christchurch Artists, Centre of Contemporary Art, Christchurch. The Cockfight, Brooke Gifford Gallery, Christchurch. Large Soaring Bird Ensnared, Robert McDougall Art Gallery, Christchurch. Bing Dawe, Neil Dawson, Stephen Clarke Auckland City Art Gallery. NZ Sculptors at Mildura, QEII Arts Council, toured New Zealand. Migrating Eels. Farnley Reserve, Cashmere. 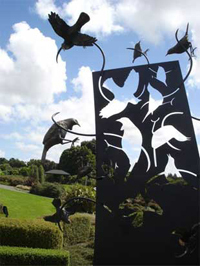 Commissioned by Christchurch City Council. Expo, New Zealand Wool Board commission of three Dilana Rugs. Serville, Spain. Sculpture for Children, Cathedral Square, Christchurch. Carpets, Lotteries Commission Building, Wellington. Redesign interior St Joseph’s Catholic Church, Lyttleton, Christchurch. Private collections both locally and internationally. Co-Judge. Cranleigh Barton Drawing award. Robert McDougall Art Gallery, Christchurch. 2001 - Muka Lithography workshop experience, Auckland. 2000 - Study tour, Italy and USA as part of Wallace Art Award. McAllister. J. Reminder of eels' slide to extinction NZHerald Nov 16, 2013. Mcnamara, T.J. Magic in tension of dramatic works, NZHerald Review. Whybrew, Christine, Dowsing and Divining, Exhibition catalogue. Take a walk on the willdside. Viva, NZHerald Jan.
Eggleton, David. Toward Aotearoa, A Short History of 20th Century New Zealand Art. 2007. Johnston, Alexa, Sculpture in the Gardens, Auckland Botanic Gardens. Catalogue 2007. pg 18-19. Reg, Graham Click. Portraits of New Zealanders. pg 139. Duncan, Margaret Change of focus, SOFA Print Project. Review. 2006. Sheils, Rosa River of creativity. 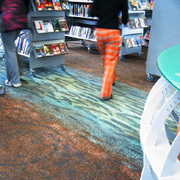 River of eels through new library. The Press, Christchurch. 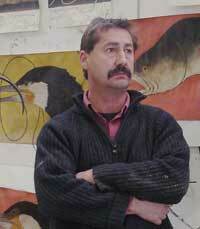 Hunt, Pennie Artists against Aqua, Exhibitions, Dunedin. Review, Art New Zealand No. 111, 2006. Green, Sonia Drawing life from the land, 2005. Powerful regional art, 26 July, 2005, Courier. McNamara, TJ. Explorations of known world, Review, March 31, 2004. Dingwall, Richard, Bing Dawe stands up for threatened native species, Review, Aug 9, 2004, Otago Daily Times. O’Brien, Joanne, Sculpture Champions birds, Review. 2003. Milburn, Felicity. The Collections - Christchurch Art Gallery. pg 134. Watson White, Helen, Fishing for meaning in the food chain, Review, Sunday Times, March 10, 2002. Rewi, Adreinne. 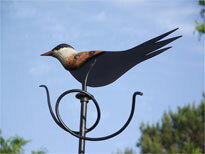 Sculptor gathers flock and puts birds on the bill? Review, 18 Aug, 2002, Sunday Star Times. Dunn, Michael. New Zealand Sculpture a History, Auckland University Press, 2002. pg 151. Macky, Ken, Out of Black Water, Review, Dec 18, 2001, Malborough Express. Moore, Christopher, Taking the eek! out of eel, Review, 2001. The Press, Christchurch. Fusco, Cassandra An Archaeology of Time and Place, World Sculpture News Vol 7. No. Winter 2001. pg 26-28. Hider, Michele Art house, sculptor Bing Dawe and his wife Shona have carved out their niche in Christchurch. NZ House & Garden, December 2001. pg 130-134. 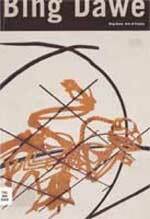 Pauli, Dorothee, The Ecological Continuum, The Career of Bing Dawe, Art New Zealand No. 94. Autumn 2000. Fusco, Dr. Cassandra A Body of Enquiry, Craft Arts International, No 48. 2000. pg 55-58. Lorimer, Wayne. Potent mix of glory and grotesqueness, Review 2000. Hider, Michele, Art House, Bing Dawe`s Art, NZ House and Garden, Dec.
Fusco, Dr Cassandra, An Archaelogy of Time and Space, Bing Dawe. World Sculpture News Vol 7. Dorothee, Pauli. The Ecological Continuum - The Career of Bing Dawe. Art New Zealand. No 94. New Zealand Who`s Who. Info NZ Who`s Who Aotearoa. Milburn, Felicity. Bing Dawe Bulletin of the Robert McDougall Art Gallery & Annex, B117, Winter June – August, 1999. pg 6-7. Jackman, Rob Ed. Acts of Enquiry. Exhibition catalogue, Robert McDougal Art Gallery. Essays: Dawe, Bing and Milburn, Felicity. Bing Dawe - Acts of Enquiry. (Interview). Paton, Justin. Fluent Wood- A Cabinet by Bing Dawe. Fusco, Dr Cassandra. Daniels, Stan. Dilana, New Fashion Quarterly, Autumn. Guest Artist. Takahe 31, August 1997. The Takahe Collective Trust, Christchurch. Fusco, Cassandra, Cultural rites of Passage, Review, The Press, Christchurch. 1997. Brown, Warwick. Another 100 New Zealand Artists. Godwit 1996. pg 24-25. Moore, Pauline, Canterbury Artist’s excellence awards, The Press, Christchurch. 1995. Fusco, Cassandra, Stimulus to Style at the CSA, Review, Art New Zealand, No. 73. 1994. pg 38-41. Concise Dictionary of New Zealand Artists. Cevit Edge International. Cassels, Winton. Dealing with the Difficult. Bing Dawe. Ansett New Zealand Southern Skies. February. Jackaman, Rob Buried Ships. Cover illustration, 1992. William McAloon, Dawe sculpture, Canterbury Gallery, Review July 1992, The Press, Christchurch. Freeman-Moir, John. Marvels and Monstrosities, The Fabulous Races of Bing Dawe. Art New Zealand No 61. 1991/92. pg 50-53. Unger, Pat Bing Dawe, Art New Zealand No. 60, 1991/92 pg 50-51. Accompanying drawings for Rob Jackaman, Palimpsest [poems], Caxton Press: Christchurch, 1990. 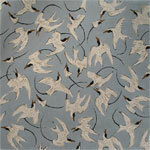 Taylor Paul, Rugged Individualism - Dilana Rugs. Pacific Way, Dec 1989 pg 57. Wedde, Ian. Contemporary NZ Print , ed Jill MacIntosh, Allen & Unwin, pg 100. Johnston, Alexa, Sculpture 1986, Aspects of Recent New Zealand Art, catalogue, Auckland City Art Gallery. Smart, Jonathan. Bing Dawe, A Decade, Art New Zealand No. 37, Summer 1985-86 pg 40-43. Brown, Warwick. So true to form, New Zealand Herald, Auckland 1985. Riley, Brett Pursuing intense theme. Review, 1984. Christchurch. Webb, Evan Bing Dawe, Christchurch, Review, Art New Zealand No. 32,1984. pg 18. Riley, Brett. The repelling art of Bing Dawe. Review 1982/83, Christchurch. Cape, Peter. Please Touch - A Survey of Three Dimensional Arts in New Zealand. Collins. pg 51-55. Michael Thomas, New Canterbury Contemporaries. Exhibitions, Christchurch. Review, Art New Zealand No. 12, 1979. pg 60. 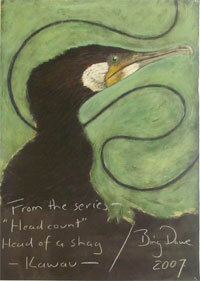 Head of a Shag- Kawau 2007. Exhibited: Selection 6-The Artist's Selection. Exhibited: Dowsing and Divining, 2010. Exhibition at the Suter Gallery, Nelson, 2009. The Light House Keeper's Cat oil on paper. Shown as part of Vinnies Art Box, 2008. Acts of Enquiry 1999 catalogue. Robert McDougall Art Gallery, Christchurch. - Figure Handstanding 1989, bronze. Collection of the Forrestor Gallery, Oamaru. From the Days of Oil- Car Part Reclaimed, 1978. Net - image of a man with missile.